It isn’t enough to protect yourself from a possible attack, it is arming yourself with the right weapon: Wildfire Pepper Spray. Protecting yourself has become a thriving industry over the last three decades. Self-defense courses are a great idea, but it is going possibly take several months for you to get to the point where you can consistently defend yourself. Guns used to be the top choice, until it was learned that the attacker could easily get the gun away from the victim and he would use it on her. Remember, a lethal weapon to be used against your attacker can also be used on you. The best choice is that you arm yourself with a non-lethal weapon and get trained on using it. The most popular non-lethal option is pepper spray. And the best is Wildfire Pepper Spray. The best scenario is you are never in a situation where you have to use it. How Does Pepper Spray Work To Stop An Attack? Which Stores Sell Wildfire Pepper Spray Legally? Where does Pepper Spray hurt? Are dogs affected by pepper spray? When should I use my pepper spray to defend myself? Who manufactures Wildfire Pepper Spray? How do I use my pepper spray to defend myself? What ingredients is pepper spray made of? Will my pepper spray expire? How long does it usually last? How can I be assured my pepper spray will work when I am attacked? Which is the best pepper spray to buy? How is the heat in pepper spray measured? Which is worse for an attacker, pepper spray or mace? Which is Better, Pepper Spray or Pepper Gel? Which is Better, Pepper Spray or a Taser Gun? Which is Better, Pepper Spray or a Stun Gun? How Old Do You Have To Be To Legally Buy Pepper Spray? When is it legal to use Wildfire pepper spray? Which states is pepper spray illegal? Can I Take Pepper Spray With Me On A Commercial Flight? Can Pepper Spray Help Me Escape a Possible Attack Situation? What Are The Different Forms Pepper Spray is Available In? What if my attacker Feels no pain from the pepper spray? What if a dog or a bear threatens to attack me? What Do I Do If The Pepper Spray Fails To Discharge? I Have Seen People Spray the Pepper Spray in their Mouth with No Ill-Effects. Is This True? What Causes Most Pepper Spray Failures? Does Pepper Spray Come From Black Peppers That Is Used On Food?? Does the oil in OC prevent CRC from being absorbed into the skin? Are All Pepper Sprays Basically The Same? How big a problem is pepper spray failure? Are There Regulations on Pepper Spray By the Government? How Can I Avoid Pepper Spray Failure? How reliable is the SHU rating? Do police have access to stronger pepper spray than civilians? Do they still use taste tester panels to measure SHU? How reliable is the OC rating? If the OC percentage matters so little, why do several U.S. states regulate it? How reliable is the CRC rating? What if a label displays both an OC% and a CRC%? How reliable is the MC rating? What is Dilution or Concentration with Pepper Spray? What is “Force” When Referencing Pepper Spray? What is the Best Measurement of Pepper Spray? How can I make sure I hit my target? How Close Should The Attacker Be When I Fire The Pepper Spray? What are the Different Pepper Spray Patterns Available? Do you use the same spray technique with all the different spray patterns and devices? What Expiration Date Should Be On The Pepper Spray? Can you give me some tips on using pepper spray effectively? What If I accidentally Discharge the Pepper Spray. Do I need to Do First Aid? What about legal issues and travel? Pepper spray has an active ingredient referred to as OC or oleoresin capsicum. The OC is taken from Cayenne peppers which are some of the hottest peppers found in the world. Unlike MACE or tear gas, which are mainly irritants, pepper spray, also known as OC, is an inflammatory agent. Contact with the mucous membranes, which are the eyes, nose, throat and lungs, can cause immediate dilation of the capillaries. When this happens, there can be temporary blindness if the eyes are hit, coughing and wheezing if the spray is breathed in. OC can create an intense burning sensation on the surface of the skin. However, OC will not cause lasting effects and usually the effects wear off within an hour or so. Because OC is an inflammatory agent and not an irritant it is still effective on those who feel no pain such as psychotics and those under the influence of drugs or alcohol. This is why pepper spray is much better to use than Mace. The most widely known are Amazon, eBay, Army Navy Surplus stores, Sporting Goods stores, Pharmacies, Wal-Mart, Gun and Pawn Shops, etc. There is not a government agency that regulates pepper spray sold as protection. However, bear pepper spray is regulated by the EPA. It is most effective in the eyes, nose and mouth. There are some effects, but greatly reduced than what humans will feel. There are pepper sprays especially formulated for dogs. Whenever you are out alone, or in unfamiliar territory, you should have your pepper spray in hand with the safety off. Walk confident with no distractions, that includes being on your phone. Your best defense if being alert and aware of your surroundings. If you are attacked from behind or the attacker comes at you aggressively, discharge your pepper spray to their face. If someone approaches you that you do not feel comfortable with, state clearly, “Leave me alone.” If they continue to approach, raise your pepper spray and repeat to leave you alone. If they ignore that as well, fire when they come into range. It is unlawful to discharge your pepper spray at just anyone. They must post as a threat to you. 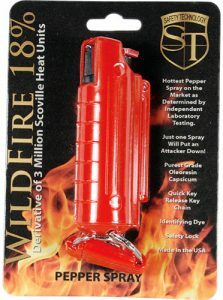 Wildfire pepper spray is manufactured in the USA by Safety Technology. They are located in Jacksonville, Florida. If you find yourself in a situation that you have to use your pepper spray make sure you have enough distance between you and the imposing threat. This is not always possible, but if you have 8-10 feet of distance, the chances of you getting the agent on you and being affected greatly diminishes. Aim the pepper spray at the eyes and facial region of the threat then release a one (1) to two (2) second burst of spray. After you have done this you need to MOVE from where you were standing but always keep your eyes on the threat. The reason you want to move is the pepper spray will temporarily blind the attacker, but they will mentally remember where you were standing and many attackers will make aggressive moves to grab you, hit you, and hurt you as you just hurt them. Pepper spray can take a couple of moments to cause the reaction which will stop the attacker from their aggressive behavior. This is also why you want to move. If the attacker continues to be aggressive, hit them with another shot of pepper spray. Make sure you are constantly gauging the situation and as soon as the threat appears to be neutralized, you will want to get out of the area you are presently in as quickly and as safely as possible. Pepper spray is a derivative of the Cayenne pepper, which is one of the hottest peppers in the world. The oils of the cayenne pepper are then extracted. This is done using a high-pressure process. If done improperly, the “heat” of the pepper can be lost greatly reducing the effectiveness of the spray. Once completed, what you are left with is the active ingredient in pepper spray. This is commonly known as OC or OleoResin Capsicum. Yes, it will expire, but the main active ingredient, OC, doesn’t expire. But even though the main ingredient will not expire, the formulation and being in the aerosol container does expire. Usually an expiration date is 2 to 4 years from the date of manufacturing. Look at the container, not the packaging. Any use of the spray beyond the expiration date is not recommended. Your life and well being could be compromised with expired spray. We strongly advise you to replace your pepper spray every year so you always have full potency in case you need it. Test your wildfire pepper spray every 90 days. Testing is simple. Go outside, determine which direction the wind is blowing and stand with the wind blowing on your back. Hit the trigger for one-half second. Did the spray discharge? If so, you are good and can store your spray again. Just make sure you wash your hands very well afterwards just in case there is any residue. Small pepper spray containers are the best choice if you are going jogging, out for a walk, or traveling on business in an area you aren’t familiar with. Because of their compact size, they can be store in your purse, pocket, or on your key ring for easy retrieval when you need it most. The key to picking the right pepper spray is if it is convenient enough for you to always carry it. There are many women who have left their pepper spray at home because “it is just too bulky and nothing will happen today” and that is when they are attacked. The actual heat that an attacker could feel after being sprayed in the face with a dose of pepper spray is measured in what is referred to as Scoville heat units (SHU). You may have heard of SHU is you have gone out and eaten spicy chicken wings at a local pub. How hot is hot?!?! For instance, a jalapeno pepper, which is the most common hot pepper used in food, is measured at 5,000 SHU. Taking that up a notch with a habanero pepper which clocks in at 300,000 SHU. That is 60x the hotness. With that in mind, and if you have had habanero chicken wings, you know the spiciness is overwhelming. So how hot is OC spray in terms of SHU? The typical run-of-the-mill pepper spray on the market contains 10% OC. This level can register the heat index up to 2 million SHU. That is nearly 7x hotter than a habanero pepper, and 4,000x hotter than a jalapeño. Many people confuse pepper spray and mace. They are very different. Mace is what is known as an irritant while pepper spray is an inflammatory. Mace is most similar to tear gas. Mace is not a type of spray, but a brand. This is why most stores do not carry Mace but only pepper spray. The original Mace contained phenacyl chloride, the active ingredient in tear gas. Now Mace manufactures a variety of non-lethal self-defense products, including pepper spray. To say one is better than another is not the issue as it is more of personal preference. With the spray, usually you are going to get a stream of the agent while with the gel, you are going to get more a disbursement. The gel will “tag” the aggressor more than the spray will, also the gel is better at close range as there isn’t as much of a “blow back” from hitting the target and splashing back on you. This is going to be an issue with size and portability. Most taser guns are bulky and cannot be carried in some purses and for sure it can’t be carried on a key chain. In terms of stopping power, the taser gun requires a lot of training so you don’t injure yourself when producing the stopping charge. Stun guns are easier to carry and use for a first timer than a taser gun. Again, to say one is better than another cannot be stated, as each tool in the self defense arena is all based on customer preference and what feels good to them and what level are they confident and feel safe. You must be 18 years or older to purchase pepper spray. No exceptions by law. If you buy pepper spray from a store you will be required to show ID. You cannot discharge pepper spray anywhere and for whatever reason. It can cause serious harm to others. You should only use pepper spray if you feel threatened or if you are protecting an individual who is not capable of defending themselves. If you are found to have discharged your pepper spray improperly, you could face criminal action and be arrested. Not only can you be sued by the affected party, you could also face a fine and prison time for up to three years. Examples of misuse: Spraying others in anger, or “as a joke,” or “testing” on others without their consent. You should treat your pepper spray container with the same respect and care as you would a firearm. Keep it in a safe place and don’t play around with it. Don’t threaten to ever use it unless you intend to follow through. Never allow it to be within reach of a child. Alabama – criminal use of inappropriate discharge / use of noxious substance. Alaska – Must be 18 years or older. Cannot have pepper spray on school grounds unless individual is 21 years or older, or if there is written permission by school administration. Arizona – no restrictions on record. Arkansas – Legal with restrictions, as the container cannot be greater than 150cc. You cannot use pepper spray on an officer of the law. California – Legal with restrictions as the weight of the substance cannot exceed 2.5 ounces. Misuse of substance can result in fines of up to $1,000.00 and imprisonment of up to three years. Misuse is labeled as a felony. Delaware: Legal with some restrictions. Delaware law defines pepper spray as “disabling chemical spray.” It cannot be possessed by a minor and there are severe penalties for criminal use of the sprays. District of Columbia (Washington D.C.): Legal with some restrictions. Fully lawful if used or possessed by a person age18 or over “in the exercise of reasonable force in defense of the person or the person’s property only if it is propelled from an aerosol container, labeled with or accompanied by clearly written instructions as to its use, and dated to indicate its anticipated useful life.” There is a registration form which the buyer must fully complete, and the selling vendor must forward the completed form to the Metropolitan Police Department within 30 days of purchase. Florida: Fully legal. Pepper spray is defined as “a device carried solely for purposes of lawful self-defense that is compact in size, designed to be carried on or about the person, and contains not more than two ounces of chemical.” Using Pepper Spray against a law enforcement officer is prohibited under any circumstance. Hawaii: Legal with some restrictions. Only OC products are legal for use by or sale to persons age of 18 and over. A ½ (one-half) ounce size restriction and licensing requirements. Illinois: Legal with some restrictions. The use of Pepper Spray is legal for carrying by a person age18 years or older. In the City of Chicago (a) No person shall use any device to discharge a noxious gas or liquid in an enclosed room in any Class C-1 or Class C-2 Assembly Unit, as defined in Chapter 13-56 of this Code, or in an enclosed room in any restaurant, bar or tavern that is a Class F Assembly Unit as defined in that chapter, if more than 20 (twenty) persons are present in that room, unless the person is a peace officer, as defined in Section 8-20-30 of this Code, engaged in law enforcement activity. As used in this section, “noxious gas or liquid” means mace, pepper spray or any other substance that is intended or designed to cause irritation to the eyes, nose or mouth, or to cause nausea. Maine: Fully legal. The criminal use of Chemical Mace or a similar substance is a violation of the law. The use of such a substance in defending one’s person or property is authorized. Maryland: Fully legal. Allows any person to carry as a reasonable precaution against danger. Massachusetts: Legal with some restrictions. A license is required to sell and to carry pepper spray. Therefore, the unlicensed sale is illegal in the state of Massachusetts. Massachusetts residents may only purchase from licensed Firearms Dealers in the state. The licensing authority is the local chief of police or other persons authorized by the locality. If you live in or plan on visiting Massachusetts and you want to carry pepper spray legally, the pepper spray law says you must get a FID (Firearms Identification Card). Visit a local Massachusetts police station, show two forms of ID, fill out a form, pay $2, and the card will be sent to you usually within a week. When you get your FID card, keep it on your person at all times. Until you receive your card, you are not allowed to carry pepper spray within the state. According to state officials there is no lee-way given to someone who knows about this law and does not follow it. Even if you have filled out the forms, and state to the officer you have filled out the forms, until you receive your card you are breaking the law and could be subject to a fine and/or arrest. The arrest can include detainment for up to 48 hours. Michigan: Legal with restrictions. Michigan law contains size restrictions (no more than 35 grams of CS or no more than 2% OC, and no combinations of CS and OC are allowed. Sales to minors are not allowed. Minnesota: Fully legal. The use is permitted “…in the exercise of reasonable force of the person or the person’s property only if it is propelled from an aerosol container, labeled with or accompanied by clearly written instructions as to its use, and dated to indicate its anticipated useful life. The law here gives the right of localities to decide of its legality. Nevada: Legal with some restrictions. Nevada law prohibits possession by minors or convicted felons. For use by adults only with no more than two (2) fluid ounces in the form of an aerosol spray designed for personal protection. New York: Legal with some restrictions. The possession by persons who are not convicted felons or who have not been convicted of an assault, age of 18 or over for the protection of person or property and its otherwise lawful use is legal. The definition is “a pocket sized spray device which contains and releases a chemical or organic substance which is intended to produce temporary physical discomfort or disability through being vaporized or otherwise dispensed in the air. There are certain labeling requirements. Sales require both a seller’s license and the completion by a purchaser of a registration form. New York residents may only purchase from licensed Firearms Dealers or licensed Pharmacists in that state. No more than two (2) sprays may be sold at any one time to a single purchaser. North Carolina: Legal with some restrictions. Possession and use is lawful for non-felons so long as the device does not exceed (150cc). Pennsylvania: Fully legal. “Chemical mace” is specifically excluded from the definition of weapons. There appears to be no regulation or restriction on their lawful use. Even though Peppy Spray is different than Mace, per the definition it is excluded as a weapon. South Carolina: Legal with some restrictions. It is lawful to possess a container not exceeding fifty (50) cubic centimeters (50cc). Washington (State): Legal with some restrictions. The state authorizes the sale and use of Pepper Spray. There is an age restriction to persons age 18 and older, or 14 with a parent or guardian’s permission. Wisconsin: Legal with restrictions. UV Dye or combination sprays are not permissible. A “device or container that contains a combination of oleoresin of capsicum and inert ingredients” is permissible. By regulation, OC products with a maximum OC concentration of 10% and weight range of oleoresin of capsicum and inert ingredients of 15-60 grams is authorized. Further, the product can not be camouflaged, and must be designed to prevent accidental discharge. In addition there are certain labeling requirements. No. Pepper Spray is not allowed on any commercial flight and it will be taken from you at the TSA screening area if you attempt to get it on board. If the TSA screener believes that you willfully attempted to get it on the plane, you could be held for further questioning which could result in you missing your flight. There is a fine of up to $25,000 for having Pepper Spray on a commercial flight. This is what pepper spray was primarily designed for, to help you escape a possible dangerous situation through non-lethal means. Imagine it is late and night and you are walking to your car alone in an isolated and deserted parking garage. As you approach your car, a stranger appears from behind a column and starts moving aggressively toward you. You feel wary, but you already have your pepper spray in hand, your finger on the trigger button and ready to fire. You put your arm up with the pepper spray in hand and say directly, “Leave me alone” but he still comes toward you. When he is within 6 or 8 feet of you, you spray directly into his face and into his eyes. Almost immediately, he claws at his face, screaming in pain and attempting to wipe the spray away. His face contorts and his eyes squeeze shut because they feel like they are on fire. You get in your car and leave the scene as soon as possible and get to a safe, well-lit location. You instinct will be to drive home and try and forget everything that just happened, however, you don’t want to do that. You must protect yourself from the potential legal aftermath. Nearly every parking garage has security cameras and your attacker can claim you assaulted them. By calling the police and telling them what happened not only will you have a police report, but there is a strong chance the police can catch the perpetrator. This protects you and others from future attacks. Back in the parking garage, the stranger’s nose fills with mucous and he starts choking on his own snot, which sets off an uncontrollable coughing fit. As he finds it harder and harder to breathe, he begins to panic. This makes it even harder for him to breathe. There is a strong possibility he will vomit. His skin may also blister in the areas which were hit by the pepper spray. These effects can last 15-30 minutes. If the attacker does get away before police arrive, they can trigger the effects again as their first instinct will be to wash the affected area either in a public bathroom or at home taking a shower. Pepper-based products include sprays, gels, foams, foggers, and guns. This is possible if your attacker is drunk or on drugs. There are cases where some people have a medical condition or are immune to pain caused by the pepper spray. However, since the active ingredient in pepper spray is an inflammatory, he will still be phyically affected with swelling in the areas which you targeted. Mace stops attackers with pain, Wildfire pepper spray stops attackers by immobilizing them by inflaming the eyes, nose, mouth, and lungs. Specialized versions of pepper spray are available for use against dogs and bears which are more powerful. This is why it is vital to test your pepper spray every 90 days. If it fails to discharge and your attacker is getting closer, as confident as you can say, “One step closer and I will empty my pepper spray in your face.” Your best hope is they don’t call your bluff and leave. If they call your bluff, use any self defense training you have gone through to protect yourself, make as much noise as you can, calling out for help, and try as best you can to dig your nails into his eyes. Yes and this is a tactic that is used in many self-defense stores to get you to buy expensive up-sells, such as guns or other products that are far more expensive than pepper spray. How do they do it? Well, if you can take hot food like jalpeno peppers, you can take the spray to the mouth, however, if this same person sprayed themselves in the eyes, they would feel the effects and possibly need medical attention. Pepper spray is designed to be sprayed in the face to affect the nose, eyes, and lips. Improper storage is the leading cause. Next is placing it in extreme heat (direct summer sun heat) and extreme cold. If you follow the directions listed on the product you will not have a problem. Does Pepper Spray Come From Black Peppers That Is Used On Food? No, only chili peppers are used. Black pepper does not have the same stopping impact. One rich source of heat-bearing chemicals is oleoresin capsicum (OC). OC is the orangey, oily or waxy substance left after “mashing and cooking” peppers until all the water has evaporated and the cell walls have broken down. If you further refine OC, you are left with capsaicin and related capsaicinoids (CRC). Further refine the CRC and you will get major capsaicinoids (MC). OC, CRC and MC can all serve as the active ingredient in a pepper spray. (OC is so commonly used that pepper sprays are often called OC sprays, particularly by law enforcement.) Some manufacturers make the active ingredient; others buy it and then assemble the finished product. Does the oil in OC prevent CRC from being absorbed into the skin? While it is true that oil is less readily absorbed, CRC does not need to be absorbed to be effective. Dye is put into the formula to “mark” your attacker and make it easier for police to identify them as your attacker. Similar to the “blue dye” that is contained in bank bags during robberies. Simply, do not buy that product. If you are attacked, you need to focus your time protecting yourself, not mixing the ingredients. You have a very small window of time to effectively protect yourself. No, and they are vastly different, and not just how they look on th outside, but also how they are built inside. Some manufacturers do a much better job of mixing the ingredients than others. So some pepper sprays separate when they sit on the shelf or lie at the bottom of your purse, pocket or knapsack. That is NOT a good thing. So an inferior brand of pepper spray could mean losing precious seconds to shake the spray. It could also mean that, even after shaking, the active ingredient might not get out! Every site on the web will claim to sell the best or hottest pepper spray on the market. Clearly, they cannot all be right. Unfortunately, the manufacturers of oleoresin capsicum (OC) and self-defense weaponry employ few, if any, analytical measures to determine the concentration of active ingredients in the product and to ensure consistent chemical composition. Variability in the concentration of active ingredients might explain why pepper sprays have been shown to be only 70% effective in discouraging attacks by aggressive individuals. That is right. There is a 30% chance your pepper spray will fail when you need it most! The problem is due to poor quality control at the manufacturer level. That’s why it’s important to choose from established and reputable brands, such as, Mace, Sabre, Wildfire and Pepper Shot. Oleoresin capsicum (OC) is the active ingredient in many pepper sprays. The only federal oversight comes from the Environmental Protection Agency (EPA) and that agency only watches over the manufacturing of bear deterrent spray. There are two (2) things you can do to make sure that your pepper spray fires when you need it most. Make sure you buy pepper spray made in the USA. 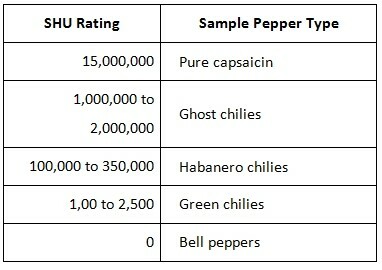 Unlike CHR, SHU (Scoville Heat Units) ratings can be useful. In fact, manufacturers use them to determine which peppers to use when they make OC, CRC or MC. SHU doesn’t vary only by the kind of pepper. It also varies based on growing conditions – like where the peppers grew, the nutrients in the soil and how much sun the peppers got. Not likely. The same formulation in products sold to law enforcement is the same as available to civilians. The difference is in the packaging. If law enforcement needs something stronger, they use a different weapon. No, they used taste testers from about 1912 until the 1970’s when HPLC became common. The OC rating tells you how much oleoresin capsicum (OC) is included among the ingredients put into the canister. But OC is not the most potent form of the capsainoids in a pepper. Moreover, the heat of a finished pepper spray depends on the type of peppers used to make the OC, not the OC itself. For example, a spray made from green chilies (also known as Anaheim chilies) is less effective than one made from habaneros. CRC and MC are both better measures of how effective your pepper spray is. It is an effort to limit the “level of force” available to the general public and (in some cases) to the police force. The CRC rating tells you how much capsaicin and related capsaicinoids are included among the ingredients put into the canister. But there are approximately 15 capsaicinoids present in a pepper, only five of which contain much heat. If the label shows both, pick a product where the OC% and the CRC% are as close to the same as possible. Or pick a product that shows the most reliable rating, the MC%. Major capsaicinoids (MC) include only the heat-bearing chemicals from peppers, in their most concentrated form. That makes the MC percentage the most reliable measure of a pepper spray’s strength, the higher the MC% the more powerful the effect on an attacker. The strength of something is measured by how much of a particular ingredient is in it. Rum has more alcohol than beer so rum is the stronger drink. OC%, CRC% and MC% all measure the concentration of the heat-carrying ingredients in relationship to all the other ingredients. Wind is measured by how many miles or kilometers per hour it blows. Pepper Spray is measured by how hot the ingredients are (SHU). Every product description should always display information about the canister design. That includes the number of shots it contains, its effective firing range and more. The more times you can fire, the more chances you have of hitting your attacker in a vulnerable spot. More shots also helps if you more than one person attacks you at the same time. Experts recommend 6 (six) feet. There are products available which have effective ranges from 8-30+ feet. It is not recommended to discharge closer than 6 feet as your chances of also getting the agent on you goes up significantly. Many canisters and other devices spray their contents in a cone shape. This is the same pattern used by hair sprays. Cone-shaped sprays are best used in enclosed spaces, like a parking garage or your home. On the plus side, your aim does not have to be as accurate. On the minus side, rain and wind can both be severe problems, as the agent may not reach your attacker to stop them. Rain – A light rain may dilute the spray. A heavier one can wash it out of the air completely. Head Wind: A strong head wind can blow the mist back onto you, which can incapacitate you. Lighter headwinds can also expose you if you stay in the area long enough. Cross Wind: A cross wind can blow the mist off-course before it reaches your target, thus not affecting them at all or minimally. If cone-shaped spray patterns resemble hair spray, then the stream, broken stream and accelerated stream patterns all resemble squirt guns. The biggest plus: They are all less likely to be affected by wind and rain, but your aim has to be better. Much better. This is one that you will need to practice to get it down. Devices that spray a pepper fog can be very helpful in an enclosed space, like your home. They are especially useful when you fill a doorway with the fog, making it less likely that anyone will want to fight their way through. This one is more for home defense than one you would take on the go. You may want to put one near your front and back doors (always be mindful of children and pets where you place it). You may want a third just inside your bedroom door. They are less likely to hit any bystanders. They are best for windy days. They stick to your attacker’s face better so even if the spray does not go directly in his eyes, it can still block his eyesight, which will make it easier for you to get away. Moreover, if your attacker tries to rub the foam off, they may actually rub it into their eyes, which will incapacitate them even more. They are safe to use indoors. No, but if you search online you can find many videos that show how to aim and fire each type of canister effectively. Both extreme heat and extreme cold can reduce the effectiveness of pepper spray, so make sure you store it in a cool, dry place, and away from pets and children. That might mean a locked cabinet, which can also cause issues during a home invasion. Storing pepper spray away from potentially flammable items is especially important. It takes only 3½ minutes for the temperature in a house fire to reach 1,100 degrees Fahrenheit. If the house is on fire, even rooms without fire in them can reach more than 300° F. Temperatures this high are enough to melt plastic and even kill people. And the temperature only has to reach 250° F. to make the chemicals in pepper spray decompose into the toxic gases, phosgene and hydrochloric acid. First of all, there absolutely needs to be an expiration date on the canister. Do NOT go by an expiration date on the packaging. You want the actual canister. Often vendors will buy soon to be expired product to repackage it in new packaging. Check to make sure the old expiration date has not been scratched off or a Sharpie used to hide it. Quality pepper spray products have an expiration date stamped on them, and they are generally 3 to 4 years in time. If you have pepper spray that is past the expiration date, dispose of it properly and order a replacement. Regardless of how prepared you are, when you are attacked, it is going to come at a time when you aren’t expecting it and will usually catch you off guard. Research shows that when you are alert, with your pepper spray in hand, finger on the trigger, aware of your surroundings you are least likely to be attacked. In fact, there is a strong chance an attacker was waiting for you, saw that you were alert and decided to bypass you and wait for a less than alert victim. One that is on her phone, not paying attention and unsure of where she is going. An attacker will always have a big advantage over you. Why? Because the attacker knows before you do that he plans to attack. If your pepper spray is in your purse, you have already lost as there will not be time for you to reach into your purse, get your pepper spray, hold it properly, aim and fire. Chances are very good that he will already be on you before you can even reach into your purse. This is why you need to be armed and ready whenever you are in a situation where you could be attacked and in a secluded area. Tip #1. Avoid attacks whenever and wherever possible. Avoiding an attack will always be your best defense. Stay away from dangerous and not well-lit locations. Travel in groups of three or more. Stay in brightly lit areas with plenty of foot traffic. You are familiar with the way the device works. Using it is second nature. You may also want to consider taking a class. Understanding how to properly defend yourself from someone qualified to teach you techniques with pepper spray in mind could save your life. Leave your phone and your ear buds in your purse. Focus instead on your surroundings. Look for subtle and even not so subtle clues around you to know if you should proceed or take a different route. If you want to read on the bus, make it a newspaper or a magazine – something that you are unlikely to fight for. While you are reading, glance at your surroundings frequently. That tells the people around you that you know what is going on and so will not be an easy target. What you do want to do is maintain a relaxed awareness of the space all around you. Trust your gut. If you are alone and someone starts following you, immediately increase your awareness and pick up your pace and look for the safest area. Make sure you are holding your pepper spray and DO NOT look back. You are looking for other people, well lit areas and stay away from dark store fronts if you are walking on the sidewalk. Avoid walking near alleyways or any spot where someone could be hiding. Some attackers work in pairs, one follows you and leads you right to his partner. The best strategy is to put more distance between you and the other person. Change your direction, except do not backtrack to where the person following you is. Go inside a building that is well lit and people are inside. Remember, your first instinct should always be to avoid an attack instead of protecting yourself during an attack. You must always be ready for a possible attack. When you are alone, you should be holding your pepper spray in your hand with the safety off, finger on the trigger, and ready to fire. Do not leave the spray in your purse or pocket. Get it out and get it ready. When interviewed, attackers have admitted backing away from a potential target if they see pepper spray. They want no part of it. Accidentally discharging your pepper spray is something you need to be prepared for as it can happen. The accidental discharge could be on you as well on someone else. So what do you do? Water is your best friend. Water will remove the capsaicinoids from the eyes, nose and mouth. And don’t think that a splash or two is all you need. Wrong. This is serious stuff. You want cool running water until the burning stops, or at least is tolerable. Natural tears will reduce the dryness caused by the pepper spray. You may feel the need to go to the emergency room, and my all means, you should. Understand that the effects of the pepper spray diminish over time. Though pepper spray is legal in in all 50 states in the United States, it not legal in all countries of the world. Moreover, some U.S. states, counties and cities restrict pepper spray sale and ownership in a variety of ways. Finally, you also have to be aware of regulations relating to air travel. Many countries restrict pepper spray use and sale. Some prohibit it all together; others require you to have a license. It is best to do your research before leaving the U.S. instead of tangling with local authorities and with customs. You can transport pepper spray by air ONLY in your checked baggage. It is highly recommended you place it in an air tight, sealed bag for transport in case it gets damaged in flight so it will not lead to ruin your clothes, or worse, seep outside your luggage to affect those who come in contact with it. You cannot pack it in carry-on baggage, purses, briefcases, etc.